Oxalis sp. Clover like leaves, lemony flavour. This much maligned weed is a refreshing garnish anywhere you'd like a lemon flavour. Around Tasmania you'll find species with white, yellow or pink flowers, and green or maroon leaves. One of the very best things about what we do here is community. There are loads of incredible, knowledgeable, like minded people about. Every one of them brings their own gifts, skills, knowledge, energy, philosophy, and every one of them is open, generous and wonderful to be around soaking up the sweet energy of shared ideals. One such energetic, knowledgeable and all round nice gal is Hannah Maloney of Good Life Permaculture. Hannah is an experienced and vibrant permaculture designer and educator. On Sunday I had the pleasure of showing a group of Hannah's students around our plot and talking about the weeds that grow here and how we use them. It was heaps of fun to be around a group so interested in the functions of plants in a landscape and open to thinking about them in different ways. We have a tendency to want to label things as good, bad, edible, weedy, native...when many plants are far more than just one thing. Taking the time to think and chat about this stuff probably raises more questions than answers, but for me the questions are often more exciting and important than answers. Questions motivate you to think and research, which in turn gives you the opportunity to see something as mundane as a weed through the spectrum of its natural history, botanical detail, nutritional values and cultural significance. Before the advent of modern vegetables many 'weeds' were important and nutritious foods. In seeking efficiency of harvest, bigger yields, consistent productivity and milder flavours, many of these plants have fallen out of favour. But many still hold significant cultural value. Traditional meals that celebrate the seasons can be found in many cultures. Pistic from Italy, Horta in Greece and Nanakusa-no-sekku in Japan. Below is a run down of what we looked at with Hannah's students on Sunday. Before you use any of this info though please be aware that a little bit of knowledge can be a dangerous thing. It is all to easy to misidentify something and, while most plants are harmless, there are others that can upset your stomach, cause allergic reactions, burn the inside of your mouth, make you sensitive to sunlight and many other unpleasant outcomes. Some may not affect you negatively but could have adverse impacts on people who are young, pregnant or have compromised health. Please read the warnings below before you make yourself a meal. Spear thistle, Cirsium vulgare Edible leaves, flowerbuds, and root. Dried flowers used as rennet, seed roasted. Great compost plant. California thistle, Cirsium arvense Perennial thistle, spreads by rhizomes as well as seed. Edible root, harvested in the first year, leaves and stems. Leaves can be used as curdling agent. This species has both purple and white flower forms. This turned up in our paddock last summer and I'll be doing my best to get rid of it this spring. 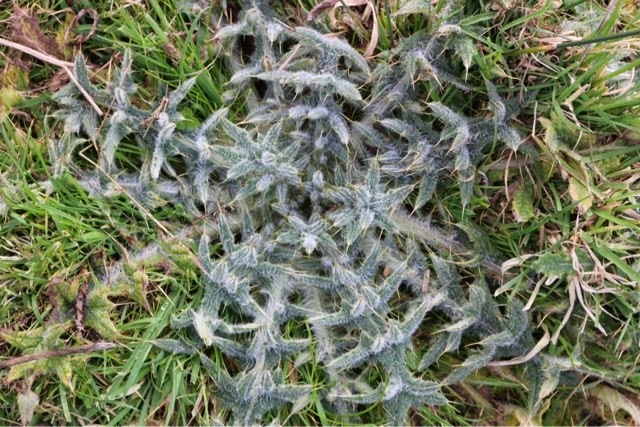 Being perennial and spreading via rhizomes I think it would be more difficult to control than the odd spear thistle. 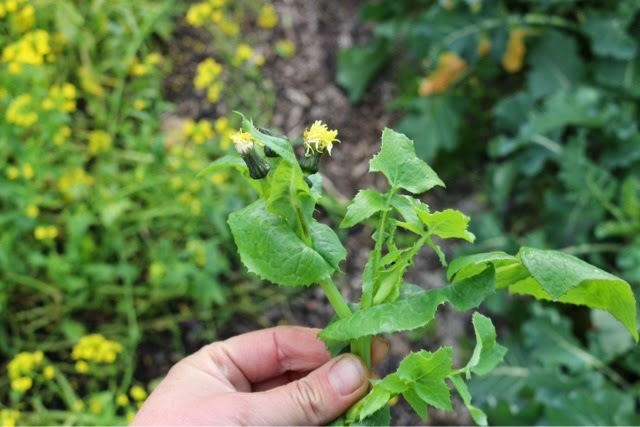 Sow thistle, Sonchus oleraceus Young, spring leaves are a tasty salad green. Older leaves can be cooked. Apparently Maori people used the sap as gum, although the medical use of the sap to soften warts makes me curious about the advisability of this. Dandelion, Taraxacum officinale Edible root, leaf and flower. Addictively bitter spring leaves are wonderful to stimulate digestion. Flowers can be battered and fried or made into ‘wine’. Out of interest, I found an obscure one while checking dandelion species in Tasmania. It’s interesting to think of how many agrigultural enterprises based on unusual plants have been tried here. 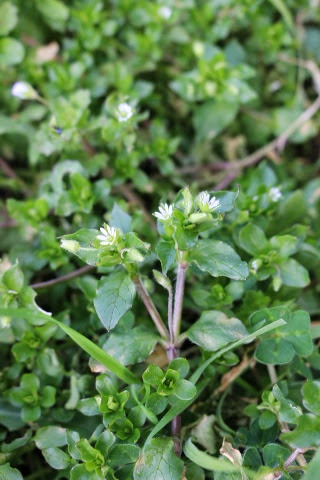 Chickweed, Stellaria media Winter active weed, grows through the cooler months. Excellent people and animal food, medicinal and great winter groundcover. Corn spurrey, Spergula arvensis Young leaves as a salad green, or if you've got a lot of time on your hands, the tiny seed is edible too. Petty spurge, Euphorbia peplus Common annual weed, used to remove sunspots, but use with caution as it’s irritating to some people and keep away from eyes. 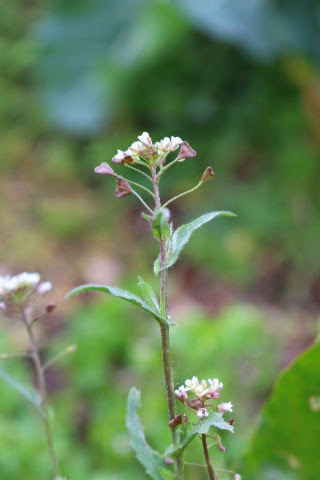 Shepherds purse, Capsella bursa-pastoris Peppery, tasty winter weed. Thrives in infertile soil. Young leaves raw, older leaves cooked. Flower tops make tasty, peppery garnish. Hairy bittercress, Cardamine flexuosa There are several native, and introduced Cardamine species, all are peppery and edible. Cleavers/Stickyweed, Galium aparine Young, tender shoots eaten cooked. Use roasted seeds as coffee substitute and leaves as a tea. Tangles of this plant are used as sieves for milk. Acetosella vulgaris syn Rumex acetosella Sheeps Sorrel Rhizomatous weed, thrives in compacted, acidic soil. Lemon flavoured leaves, in small quantities or cooked, as they contain oxalic acid, used in salads or pottage. Reported to be used as a milk curdling agent. 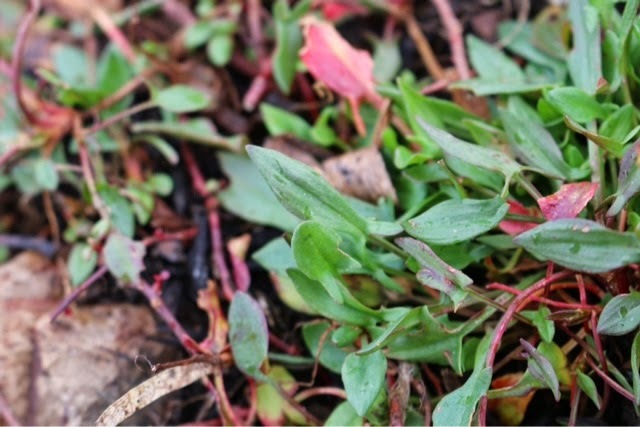 Dock, Rumex crispus Thrives in compacted, poorly drained soil. Young leaves are great in pottage, slippery and a little astringent when eaten raw. 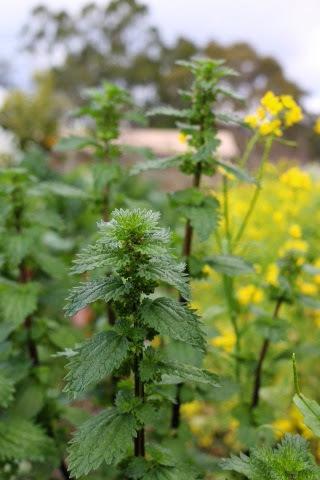 Nettle, Urtica diocea Delicious and nutritious edible when cooked to break down stinging hairs. Can be brewed into a fertiliser tea and hosts the larvae of Australin Admiral butterflies and lots of ladybirds here last summer. Fennel Foeniculum vulgare Ubiquitous and delicious weed. We cather the fronds and leaf bases in spring, the stems for throwing on a fire and adding fragrant smoke to barbeques, the pollen as a flavouring (just cut a big bunch of flowers, brush off any insects and hang upside down in a paper bag to dry) and the seeds in curries. Mallow, Malva spp Edible leaves, immature seed pods and flowers. Leaves will thicken weed pies and soothe the digestive tract. Fat hen, Chenopodium album Wonderful summer weed. Closely related to quinoa it makes a great salad ingredient when really young and a spinach substitute when mature. The seed is edible, but tiny and coated with saponins that must be washed off before consumption. Native Fireweeds, Senecio minimus also S. linearifolius, S. quadridentatis and other native species. Great colonisers (Mother Nature's band aid!) of disturbed ground and poor soil, fast growing and useful to cut for composting. Senecio linearifolius is easy to strike from cuttings and makes excellent, fast growing habitat. Not edible, but very useful plants. My thoughts on eating weeds. Only eat it if you know exactly what it is. Plants can be superficially similar, making it easy to misidentify edibles. Make sure you are absolutely confident with your identification before making a meal. You don’t know what you don’t know. 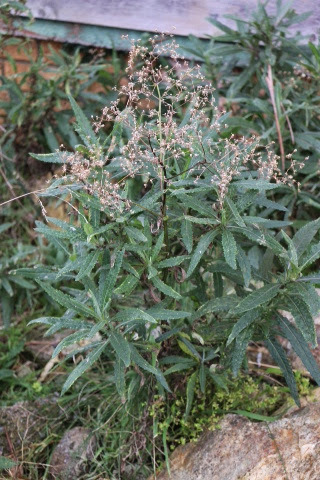 I've seen hemlock harvested by someone who thought it was a wild parsnip, a seaside daisy, probably harmless but containing small amounts of alkaloids, misidentified as sea celery and a fungi gathered for consumption in the wild in Tasmania labelled as a species that doesn't even occur here. Get to know the characteristics of plant families and use these as your guide. Use books, referenced websites and experienced people to guide you, and if you have any doubts leave it out. Only take what you need and gather from multiple plants. Generally this rule would only apply to native plants. The plants we forage from provide a number of environmental services. They provide food and habitat for other species, they prevent erosion and protect and stimulate soil life and they propagate themselves. Denude a plant and you remove all of the benefits it provides for its local environment. PLEASE! Watch where you step. Many coastal plants are edible, and they also can conceal the nests of shorebirds. Species like hooded plovers are under threat, partly due to human activity in their habitat and it is far too easy to tread on a clutch of tiny, sand-coloured eggs and not even know you’ve done it. I’ve also seen shearwater burrows collapse under the weight of a person putting the birds that use those burrows at risk and making the dune susceptible to erosion. This applies to all plants on all habitats. Many species of native orchids are difficult to see and easily trampled. And for your own safety in the warm months keep an eye out for snakes and jack jumpers. Consider the history of the site you’re foraging on. Pollution can affect the safety of food plants you gather in many differing ways. 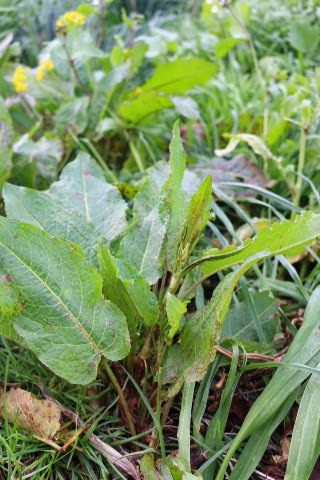 Nitrogenous fertilisers used in conventional agriculture can cause nitrates to build up to toxic levels in thistles and other weed species that are normally edible and nutritious. Old industrial areas or orchards may have heavy metal or other toxic residues that can accumulate in plant tissue. Roadsides, gardens, parks and farmland may have been treated with herbicides, unless you know the area is clean avoid it! Other reasons to gather carefully and wash what you gather are pollution from traffic, dog urine, septic runoff and a multitude of other pollutants. Don’t spread weeds or soil borne diseases. Make sure your boots, secateurs and collecting gear are free of soil and weed seeds. If you’re collecting things like fennel seed try to get all of it in your collecting bag and don’t allow it to scatter while you’re cleaning or threshing it. Keep Phytophthora in mind and avoid moving through affected areas. Try not to break the law. It is illegal to take plant material from reserves (although careful harvest of invasive species may be beneficial). Always seek permission from landholders before foraging on private land. And don’t eat any threatened species. Damsels with damsons. In any old farming area in Tasmania you are likely to come across damsons and sloes or other wild plums. Every May we take a trip to the back roads of the Derwent Valley and gather damsons to make a tart, rich jam and a thick, spicy sauce with our chillies. While we're there we gather fennel seed for curries and rosehips for tea. Identification keys, and photos of a lot of the plants that occur in Tasmania. This is helpful if you want to determine if a particular plant is recorded as being naturalized in Tasmania. Notes on edibility, medicinal and other uses of thousands of species of plants. Thank you very much for putting together. It's really useful, and I appreciate it so much. Wouldn't it be great, if people started to harvest "weeds", instead of poisoning them?